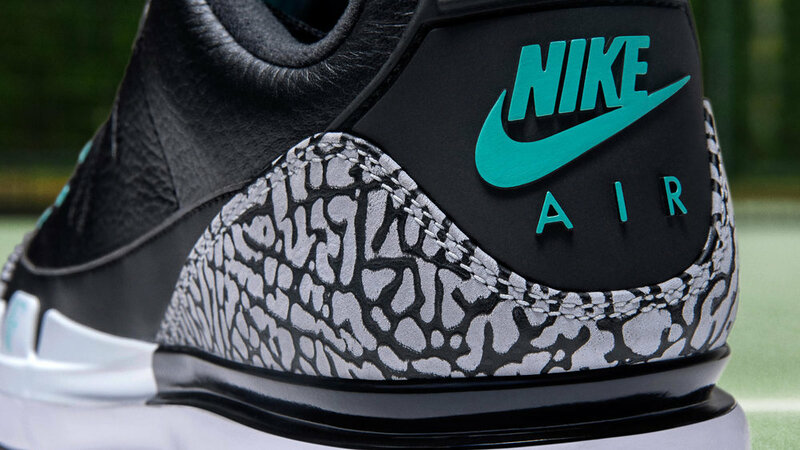 Nikecourt Zoom Vapor RF x AJ3 "Atmos"
Roger Federer’s passion for footwear is well documented. In recent months, he’s discussed his love for limited collaborations, iconic signature sneakers and even provided insight into his creative collaboration with the great Tinker Hatfield. Three of Hatfield’s most famous designs converge in the latest launch from Federer’s partnership with Jordan Brand, the NikeCourt Zoom Vapor RF x AJ3 "Atmos." Rather than go one-to-one with the archives, the shoe draws inspiration from one of Federer’s favorite Air Max 1 colorways, 2007’s Nike Air Max 1 "Atmos." The sneaker, serving as the fourth colorway of the Zoom Vapor RF x AJ3 since 2014, mixes Hatfield hits from ’87, ’88 and 2012 with a mid-2000s sneaker culture twist. The Zoom Vapor RF x AJ3 "Atmos" launches October 5 in Tokyo, with subsequent releases on nike.com and at select retailers through November.